King Y.M. Kinang is from Takum, Taraba State - Nigeria. He is lively, versatile, full of energy and adventurous. A scar veteran in the fight for the kingdom businesses. 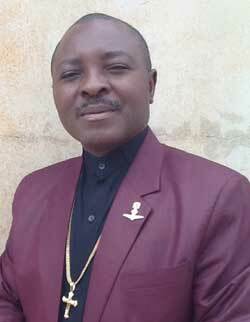 Kinang is the President of International center for peace and reconciliation (called4work institute Abuja-Nigeria), a social constructionist/chaplain, a leadeship and youth incubator, an entrepreneur, a humanitarian and the senior pastor of Favoured & Prevailing Ministries International, planted churches in Nigeria, Cameroun, Gabon with several branches. He has developed the curriculum and syllabus courses of the Theology of work concepts an appreciation, which is been taught globally in seminaries, schools, workplaces, on site and online. He served the Federal Ministry of Education in Nigeria to the capacity of assistant chief education officer (GL13) before voluntary retirement in 2007 into the missionary work in Liberia, Congo Kinshasa & Brazzaville. He is a conference speaker, training the trainers and currently serve as both Directors for Missions & Logistics of the International Circle of Faith Chaplaincy Corps (ICOFCC) and the old peoples home in Abuja. A Prolific writer, few among the books he has written includes: Building according to the pattern, The leader, the lead and the led, The good Christian Soldier of Christ, The Challenge of mission work in the present day church, The manifold favour of God. A many times Delegate and discussant in a United Nations Conferences in New York, USA represented ICOFCC. DTL (Transformational Leadership) Bakke Graduate University-Candidate, Dallas TX, USA.